I received both primer sprays free to give my opinions. All opinions are my own and I was not compensated. For the longest time I wasn't using primer at all before applying my foundation. To be completely honest, I didn't know what primer really was. I would just wash my face and immediately start applying my makeup. I always wondered why my face was so oily during the day and that's because I wasn't using a primer. My skin is a combination of oily and normal, it depends on the weather or how active I am during the day or night. With primer, it helps with smoother application of your makeup, controls oil, evens out skin tone, and reduces the size of your pores. 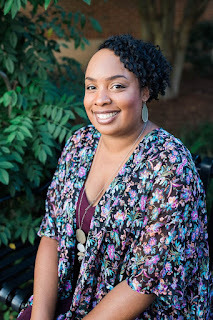 When I learned about primer 6 months ago, I went out and purchased a liquid base oil free primer. Those type of primers worked pretty good and made my makeup foundation just glide on my face and also I got better foundation coverage using a primer. When I was contacted to try SKINDINAVIA's The Makeup Primer Spray and The Makeup Spray Oil-Control before they launched, I was very interested on how it would work for me. I never heard of a primer spray before and SKINDINAVIA is the first company to come out with one. Keeps makeup fresh throughout the day. GOOD FOR YOUR PORES NOW, GOOD FOR YOUR PORES LATER! OMG I love these sprays! You got to see all the compliments I get on my makeup each day! My makeup comes out flawless using these two sprays combos! On a clean and moisturized face, I spray The Makeup Primer first in a T formation, just a few pumps. I apply my foundation like normal. After my makeup is completely applied, I spray on The Makeup Spray Oil-Control as a finishing spray. I believe that these primers sprays are so much better than using a liquid primer and so efficient. With the Summer months quickly approving, I do not have to worry about my makeup melting off my face or looking like I greased my face up with cooking oil, LOL! 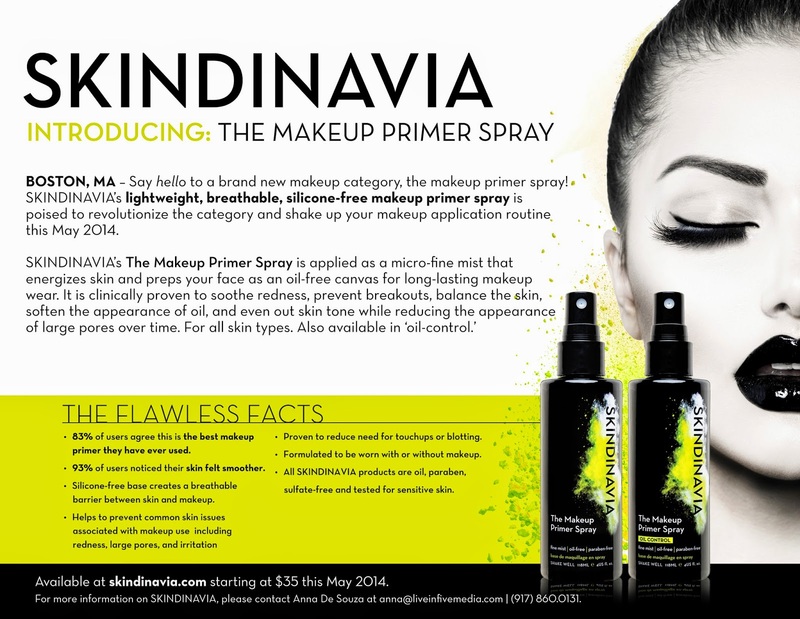 Is SKINDINAVIA’s The Makeup Primer Spray and The Makeup Primer Spray Oil-Control Worth a Try? These sprays are something that I really needed to make my makeup last all day. I wear my makeup during the Summer months too in the blazing hot weather and I need to look just like as if I just applied my makeup because I'm too busy enjoying Summer fun to be always rushing in the bathroom to powder up. Looking for a great makeup look that last all day? I'm giving away both The Makeup Primer Spray and The Makeup Primer Spray Oil-Control! Disclosure- You must be 18+ and from the US or CA to enter. Sponsor of the giveaway is responsible of the fulfillment of giving winner their prizes, not the blogger that is hosting. I wish I could beam this onto my bathroom vanity in time for the dinner Scott and I are attending tonight. I have a T-Zone so slick, you could fry my son's hash browns on the bridge of my nose. And this is oil free to boot? I'm SO in. The T-Zone is always my problem area, I hate that! Girl you're going to love these sprays because they really work out without the harmful chemicals. It seems amazing! I would love to win some to try out! It is some great primer sprays to use Susie. I've been using the Urban Decay De-Slick setting spray for years and I absolutely love it. I just noticed the other day that it's made by Skindinavia! I wonder how they compare? Great review! I never knew that Urban Decay had a primer spray and very surprising that Skindinavia made it! I, too wonder how they compare. I do wear makeup during the summer I usually switch from liquid to powder foundation this year I don't know I have to find a better powder foundation....this seems like an awesome product sure hope I win!!!! Thanks for sharing! I just made the switch from liquid to cream to powder foundation by Fashion Fair and it seems to be much lighter on my face. People say that cream to powder foundation is much heavier but Fashion Fair oil free brand is not and I wore it all Summer long in the hot South heat last year and it lasted on my face all day. You'll need to visit a makeup artist for help Victoria to properly match you. Yep, you're just like me Thalia! I live in the South and it's hot hot hot during the summer...I keep my makeup to a minimum and I only put on a "full face" for special occasions. That's a smart thing to do, I wish I could but I have old dark acne scars and use makeup to cover them up. I usually don't wear foundation much, but my daughter is always saying how important primers are to your makeup. Yes Stacie, primer is very important to make your makeup last all day. I do, but I lighten it up during the summer months since I'm out in the heat a lot. I lighten it up during the Summer months too. I do wear makeup in the summer, I love makeup and trying new products! Yes I do, unless of course I'm swimming or at the beach or something like that. I wear make-up 365 days a year. I love wearing make-up and playing with different shades and looks despite the weather or season. Plus in the summer it's fun to rock bright and bold lips with a flawless complexion. I love to rock the bright bold colors! Hi! I absolutely wear make-up during the Summer months. lol I love playing with make-up & changing up my eye shadow looks. This Summer I'm especially liking Too Faced 2014 Summer Palette. Fun!! Thank-you! I'm going to need to check out that palette, thanks Natalie! I do wear it regardless of the season, but I wear a lighter foundation in the summer. A primer is a must, otherwise the foundation will melt off in the warm weather. I try to wear full makeup even if it's hot summer but only for special ocassions. Other days I leave my fave breathe and wear just the eye makeup. Yes, I usually do still wear makeup during the summer months, but more so on my eyes, and not as much on my face. The reason being because I have really oily skin, so this product has me very interested! :-) Thanks so much for having this giveaway! Usually-it isn't any different than wearing it in the winter! Yes I do.. I definitely need to try this!